Despite early and repeated efforts over the past 5 years – Billie simply did not trust anyone to get close enough to remove the short, ankle chain. It became known as her "bracelet" and the rattle of it as she walked became a tell-tale sign she was approaching...until May 2011! After 5 years here at the Elephant Sanctuary, Billie is finally free of the chains that tied her to her former life as a circus elephant. 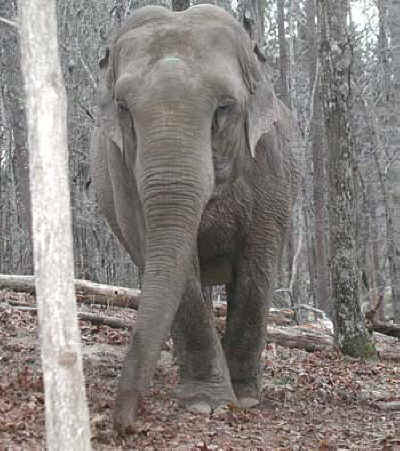 In February of 2006 at the age of 53, Billie became the twenty-first resident of The Elephant Sanctuary in Tennessee arriving with her friend Frieda. They were the last of eight circus elephants rescued from the Hawthorn Corporation—where they were exposed to TB. Billie, one of the older members of the herd and weighing 8,450 pounds, was placed with her sisters at the Q-Barn where additional medical observation and treatments are provided. While Billie enjoyed her new-found freedom at her forever home in Tennessee, Billie's front left foot held the remains of the chains that tied her to her past. Despite early and repeated efforts over the past 5 years – Billie simply did not trust anyone to get close enough to remove the short, ankle chain. It became known as her "bracelet" and the rattle of it as she walked became a tell-tale sign she was approaching. Virtually all the elephants retain scars of their captivity – both physical and emotional, but Billie's chain was an irrefutable reminder to the staff, the herd, and to Billie of what she left behind. Thanks to new efforts which began in February of this year, in collaboration with Active Environments, the Sanctuary introduced Protected Contact training. Caregivers worked consistently with Billie over many weeks and gradually managed to gain her cooperation, an amazing accomplishment after so many years of mistrust and fear. The new training entailed Caregivers remaining on one side of an outdoor fence barrier, and Billie voluntarily participated in the training activities that allowed the Caregivers to gingerly use bolt cutters to clip off the chain. Removing the chain was something we had all wanted to do for a long time but were never able to. Until the positive reinforcement training, we never had a way of telling Billie what we were trying to do so she seemed to assume when someone's getting close to her it's probably bad. Convincing her otherwise was a group effort. First Gail got her to present the foot whenever we asked for it. This quickly became Billie's favorite thing to do, she started offering it even if she wasn't asked, trying to solicit treats and praise. Then Jen and I worked on getting her used to the bolt cutters being close to her foot. We did this gradually, just 3 days a week for about 3 weeks. Our plan was to ask Billie to rest her foot on the fence and have Margaret feed her to keep her calm and let her know that we were not doing anything bad. The first cut was easy and it showed us the chain was weathered and weak. I looked at the chain for a few moments, knowing each passing second was valuable. Even though we did our best to keep her calm, we know that because Billie is so sensitive, her patience cannot be pushed too far. The first couple of cuts made her nervous and she swatted at the fence, keeping her guard up. This was totally understandable and we answered her defensiveness with reassurances. It seemed to work, because even though she would swing at the fence and back away for a second, she came right back when she was ready. After a couple of cuts to the chain, it appeared as though the light bulb went on and she actually figured out what we were trying to do! The changes may seem subtle to people watching the video, but her expression changed, her swings at the fence subsided, and she even seemed to be trying to help us by lifting her foot higher then ever, pushing it up to the bars as much as she could, and turning her ankle in different directions. After the 6th cut, there was no more that I could take off using the bolt cutters, so I set them aside. I reached out to her foot with my hand to see if I could separate the links; I was just going to test it but a slight touch caused it to slip right off. The chain rattled to the ground and we were finished. After the chain fell, Billie picked it up for a moment out of curiosity, but quickly lost interest and left it behind for good. After the camera stopped rolling, Billie went over to the sand pile and woke Frieda from her nap, perhaps to show off her new look; Liz immediately came over as well for the usual trumpeting/chirping reunion. As for why she seemed to try helping us - we will never know for sure. In the circus they said she was a "bad elephant," they said she couldn't be worked with. It turns out she just has to be asked nicely." The Caregivers keep remarking about how quiet Billie is without her chain rattling around with each step. This amazing accomplishment, while a huge leap forward for our Billie, is even bigger in light of the plight of captive elephants everywhere. It is symbolic of the freedom we all want and that they deserve, not only for our elephants here at the Sanctuary but for elephants everywhere.